Antifriction or rolling-element bearings use balls or rollers to substitute rolling friction for sliding friction. This type of bearing has closer tolerances than do plain bearings and is used where precision, high speeds, and heavy loads are encountered. In antifriction bearings, a lubricant facilitates easy rolling; reduces the friction generated between the rolling elements and the cages or retainers; prevents rust and corrosion; and, in the case of grease, serves as a seal to prevent the entry of foreign material. High-quality rust- and oxidation-inhibited (R & O) oils are generally recommended for bearings. Extreme-pressure and antiwear additives may also be desirable under conditions of heavy or high-shock loads. Oils with no additives can easily oxidize and turn gummy. Only once-through drip applicators can justify the use of straight nonadditivized oils. In fact, R & O oils are probably just as inexpensive today. When temperature control and cooling are a consideration, oil-circulating systems are the choice. A bearing lubricated with either oil or grease does not carry away heat on its own. 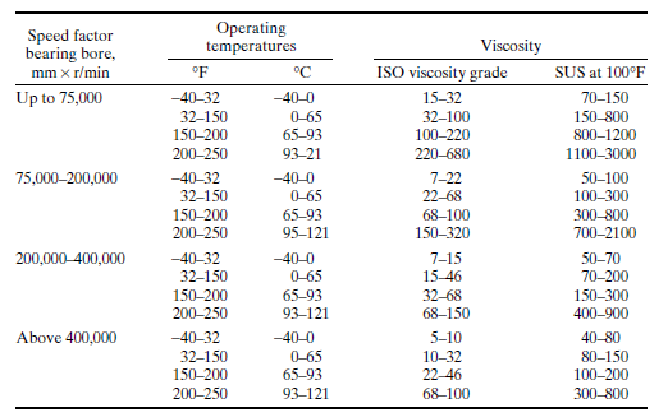 Table below gives general guidelines for the selection of proper viscosity oils for antifriction bearings. Most antifriction bearings are grease lubricated because of the economics of simple seal and housing designs. Greased bearings offer adequate protection from dirt and water, and require infrequent attention. The selection of the proper type and grade of grease depends on the operating conditions and the method of application. Generally, soft greases (e.g., NLGI 1) are preferred for use at low temperatures and in central systems. 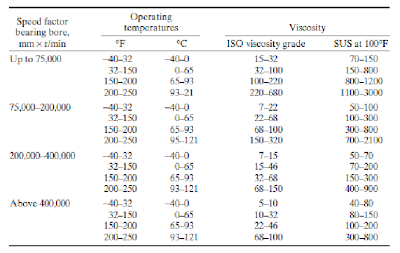 Harder greases (e.g., NLGI 2 or 3) perform better at high speeds. Ball bearings do best with NLGI 2 or 3 grease, while spherical, cylindrical, needle, or tapered roller bearings with broad face line contact design require NLGI 2 or less. Care should be taken not to overgrease antifriction bearings. Generally, the bearing housing should be one-third to one-half full. Overfilling can lead to several problems: ruptured seals, excessive temperature buildup, and eventual failure due to starvation of the bearing for lubricant. With repeated greasing and continued high temperature, the oil in the grease may be driven off, leaving the soap in the bearing. Soap makes up about 8 to 10 percent of grease. It is easy to see that if the oil portion of the grease repeatedly is eliminated, the soap can rapidly fill the voids in the bearing. Eventually the bearing will accept no more grease because it becomes filled with soap, a non lubricant. The bearing then soon fails, and the unlucky grease sales representative is told that the grease is poor quality. Many PC software programs are available that can aid in the selection of lubricants in the initial design and in failure analysis. These can be obtained from many lubricant manufacturers. I sent invites over our internal networking site and also tried to encourage people to use tweet but participation was poor, and it was hard to show any substantial benefits. Based on the bearings types and speed we want to choose the grease type. For roller and high speed bearings, grade 2 bearing type is suitable one.